A great boost to this island’s tourism, Siquijor is the only tourist destination in the Philippines awarded the ASEAN Standard Homestay Award during the 35th ASEAN Tourism Forum. Five homestays from this island, namely Agan’s Homestay, Ates Homestay, Estelita Homestay, Xylla’s Homestay, and Daval / Omandam Homestay, received the coveted award during the ATF 2016 attended by Tourism ministers of Asian countries and their delegates. 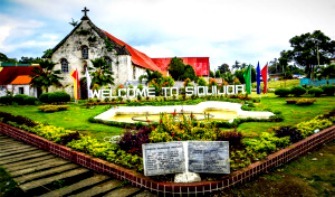 “Siquijor is the only destination awarded with such reputable distinction for homestay Philippines,” said Siquijor Senior Tourism Officer Jossette Almirola as she thanked the Department of Tourism (DOT) for pushing Siquijor to qualify for the award. Almirola calls it one of the proudest moments for the homestay awardees. She said she did not expect that Siquijor will be given the award for Philippine homestays since five island-provinces in the country were eyed and assessed by DOT to get the award. She vowed to strive harder to improve the island’s homestays and encourage more homeowners to join the program especially since Siquijor's tourist arrivals increased by 51.21% for 2014 to 2015. Recognizing the provincial government’s efforts, she hopes that it continues to support the tourism programs and activities. The first ASEAN Homestay Award ceremony was convened to provide opportunity to promote ASEAN Homestay and understanding of the basic requirements of a quality visitor experience, and to establish a minimum standard across all ASEAN member states, said the provincial tourism officer. In this ceremony, the ministers awarded 31 ASEAN Homestay Standard Certificates to homestay organizations and providers that will enhance local quality local quality of life to generate income, support local culture, arts and crafts business, encourage restoration of local and historic sites, and foster nature conservation efforts through community education. Homestays are awarded in all ASEAN-member nations, but for the Philippines, only Siquijor homestays were conferred with the award, Almirola disclosed. The other awardees come from Brunei (2), Cambodia (5), Indonesia (5), Lao PDR (1), Malaysia (5), Thailand (5), and Vietnam (3). The proposed validity period for the ASEAN Homestay Standard is three years. Certified homestays will be reassessed every three years to renew their certificates. This will enable the government tourism organization to update and monitor the performance of certified homestays to ensure that they maintain their quality and standard as ASEAN Standard Homestays. With the theme, “One Community for Sustainability,” ATF 2016 was attended by 457 buyers and 1,000 exhibitors with 467 booths as well as 83 international and 100 local media. The ministers noted that ATF 2017 will b e convened on January 16 to 20 in Singapore with the theme: “Shaping Our Touism Journey Together”.